There are only a few big names when it comes to Internet speed tests. Speedtest.net, for instance, is a name many people know and trust. However, there is another speed test app that you should know about called nPerf Speed Test and we’re going to take a look at it right now. nPerf Speed Test tests not one, but three different metrics. It’ll test your Internet speed including upload, download, and ping. It can also test your browsing performance by opening a slew of websites and seeing how long each one takes. It’ll conclude the test with a YouTube streaming test that streams video at 260p, 360p, and 720p to see how long it takes to load, how much data is used, and buffer time if there is any. This far more testing than your traditional speed test and it makes nPerf feel like a real all-in-one kind of test. Once the app has completed its workout, you’ll see the total results of the test along with an aggregate score. Your score can be compared to other ISPs and shared with others if you wish. The app is able to discern what kind of connection you have (3G, 4G, WiFi). On the History page in the app, you can also see and keep track of where you did you speed tests on a map so you can compare speeds based on your location. In the Settings, you can tweak your experience to a degree. You can set things like your network type, bitrate units, default test, language, background style, and whether or not to record your GPS location. There is also an option to set a warning to let you know you’re about to reach your data plan limits (if you have limits). The developers also claim to use less than half of the data for their tests that other test apps use. nPerf’s UI is fairly straightforward. The interface is simple to understand with Holo-style hamburger menus so navigation is simple and reasonably predictable. It is very simple to use. You select your test type and hit the go button. Then you sit around and wait. The design itself is colorful and enjoyable. The buttons are large and easy to see and nPerf manages to look good without overdoing it. Animations were fluid in our testing although we’re sure you’ll see some stutter on older devices. Doesn’t just measure speed like most competitors. It also measures streaming performance and website loading performance as well. The app also measures averages along with maximums for more metrics than most competitors. It’s very simple to use. You can run a full test as soon as you open the app or choose an individual test in the hamburger menu by tapping in the top left corner. The ability to map where you do your speed tests, review testing history, and compare to other ISPs and phone services are pleasant extra features for those who are seriously into network testing. The design is very clean. 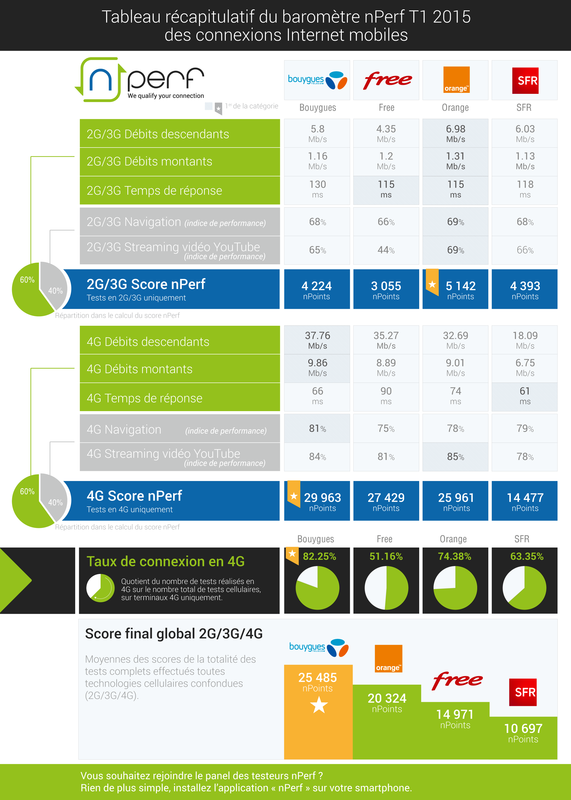 Contributing your speed test data to nPerf also helps them compile information like this from France where they can put together graphs and charts about what carriers do the best. According to nPerf developers, their official website will soon host coverage maps and network data performance. nPerf uses dedicated and optimized servers for a more accurate speed test. nPerf has a function to warn you when you’re about to reach your data plan limits. For instance, if you have a 1GB plan, you can have it warn you when you’ve used 800MB. Android has this functionality built right into the OS so we didn’t see a real need for this feature. It’s not bad, just redundant. Like most benchmarks, you probably won’t be using an app like this every day. Overall, this is a very solid Internet benchmark app. The various levels of testing give it more of a real-world feel and the design is simple enough for anyone to use. It has a few features that aren’t really needed or necessary, but they can be easily turned off if you don’t want them. If you’re interested in trying it out for yourself, click the button below! 10 best new Android games from April 2019! 10 best new Android apps from April 2019!